Now enough about my business. I want to tell you why I started crafting in the first place. I started crafting because I always admired wire wrapping and wanted to learn how to create great wearable art myself. So four years ago I enrolled in a community college jewelry making course and learned the art of crafting wire into wearable art. 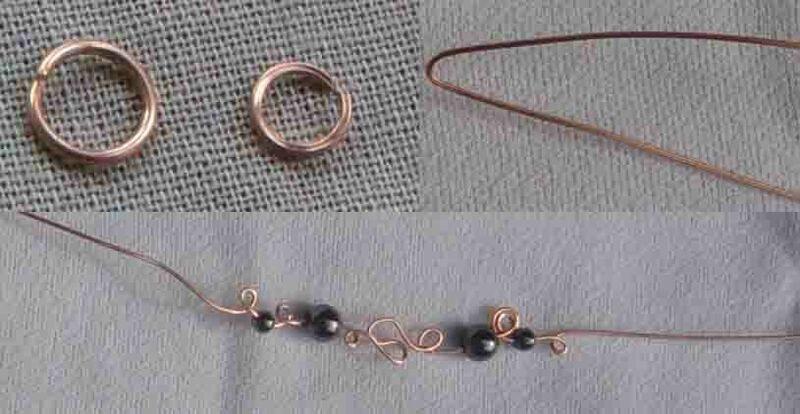 The course I took introduced me to the world of wire and the many shapes that one could use to create jewellery. There is the ubiquitous round wire which is used to create most jewelry and what most people are familiar with. There is also a “flat” or square wire which is good to use in order to obtain a more “geometric” look for jewelery, and lastly there is “half round” wire which is used for binding wire together. Like most people, I started using copper wire as “practice” wire because using silver wire can be quite expensive—especially if you make mistakes and have to “re-do” the whole piece. However, the more I used copper the more I liked it. The wire was a lot easier to handle than sterling silver wire and kept its shape a lot better than silver. Not only that, it looked great with its earthly warm colour, it would develop a great patina over time-unlike Silver which would develop an ugly tarnish if not polished regularly. People would also comment how they liked wearing copper jewelry in general because of the health benefits associated with it. So there you have it. Crafting with copper is fun, you could create great looking jewelery with it, and it has added health benefits to it too. My inspiration comes from experimenting with many different techniques and styles which wire artists use to create beautiful jewelery. I'm an average woman living an urban life in a big city. I need a creative outlet and something to supplement my drive. This is my journey. Business Plan? What Business Plan? Let me take a step back-why I opened a shop….